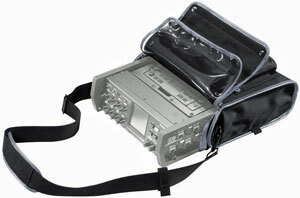 Location sound recordists no longer require the heavy weight and expense of a separate recorder and mixer set-up. In one single, straightforward, easy-to-use device the Roland R-88 includes all the features required by field sound professionals including a solid state sound recorder, full on-board mixer, a choice of timecode modes and slate tone/mic for memos. The stereo mix output on the R-88 is perfect for location sound recording applications enabling a stereo mix back to the camera to record reference audio or provides a stereo monitor output while simultaneously recording individual tracks. With 8 discrete outputs you can also embed the audio tracks into a SDI video feed by using a multi-channel SDI audio embedder. It also features professional AES/EBU digital I/O to digitally record from or send to a mixing console or other digital source. The R-88's built-in mixer is equipped with a 3-band EQ enabling a quality stereo mix to be monitored and/or recorded simultaneously along with each discrete audio track. The large touch screen display enables clear and intuitive device setup and control. You can also lock the display and front controls to avoid any accidental operations. Beyond field applications the R-88 is nicely suited for post-production environments featuring a built-in 10-input/8-output USB audio interface for multi-channel recording. 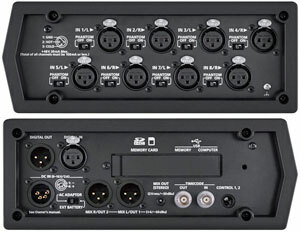 The eight-output ports are especially useful for surround projects. The interface function is also able to provide a backup record mechanism simultaneously recording all tracks to a DAW of your choice. The R-88 is extremely portable weighing less than six pounds (2.7kg) including eight AA batteries. Optional accessories include a custom carrying bag, and remote footswitch controllers for start, stop and record, marking functions, etc.